A celebratory dinner was in store a month or so back and Jim asked me where I’d like to go; I’ve been wanting to go to Duck and Waffle for so long but never had enough of an excuse to go. Yeah yeah, waaaaaay behind the curve on this one. 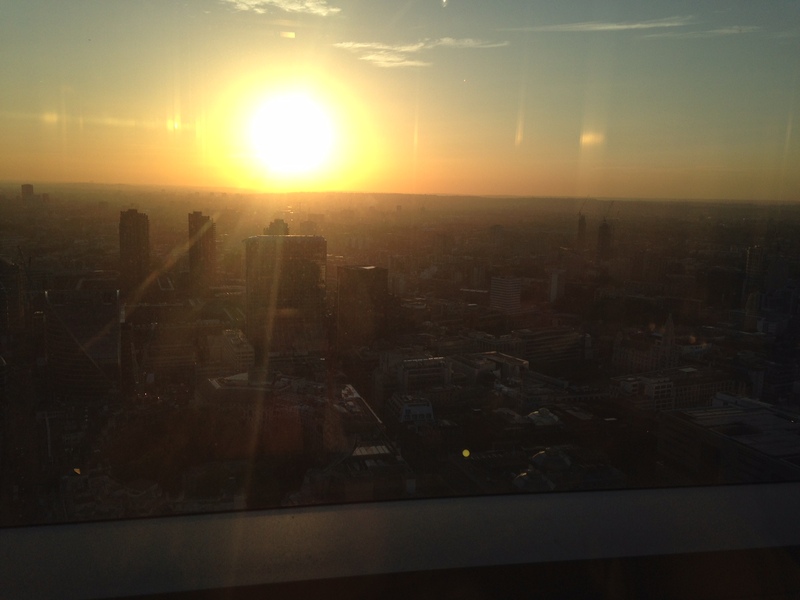 I may have mentioned the engagement when booking; I’m not prepared to say, but we got the best table in the whole place, a corner table with unbelievable views all over London – so, thank you to the lovely people at Duck & Waffle for that! The staff couldn’t have been nicer, turns out I happen to have worked with a couple of them and it was lovely to see them so happy. 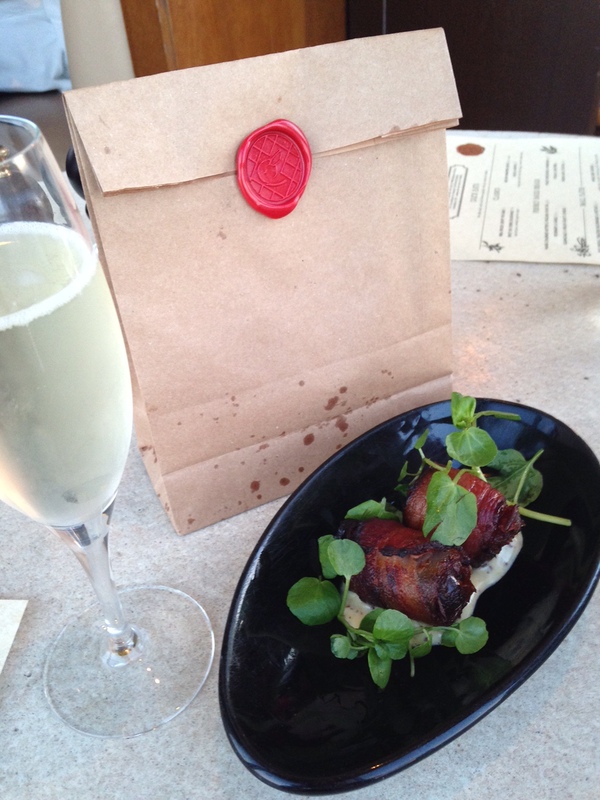 Champagne arrived and some snacks, the signature bbq-spiced crispy pig ears and the dates wrapped in bacon with manchego. Those pig’s ears. Oh my god! Get a bag each, they are way too good to share. We went for a seriously greedy set of options that was pretty meat heavy. However an enormous bowl of Dorset crab arrived first, it wasn’t mucked about with, simple, good quality crab meat and a fresh start to our pig out other dishes. Lamb breast with gooseberry raisins came next, beautifully glazed making it slightly sweet which was gorgeous with the slight char on the underside. The greatest dish in the history of like ever happened next. Beef tartare with a marmite yolk. Roughly chopped beef, beautifully seasoned and presented with a marmite doused egg yolk nestled into the middle of the dish just crying out to be pierced. Not too much marmite that the meat is too salty, just enough to have you making all sorts of raised-eyebrows-and-sideways-glances-from-the-next-table noises. An absolute show-stopper for me. I have no idea how they do the yolk but I’m going to figure it out, be prepared for several annoyed tweets / instagrams of broken slightly off-colour yolks! Did I mention we were being greedy…? The long-horn arrived next with a sauce gribiche and a raw summer salad. And some potatoes with marmite and what must have been half a cow’s worth of reduced beef stock – they were the richest thing in the entire meal, and yes I used a spoon to scoop up the sauce like thick unctuous soup – I’ll let you know when the gout kicks in. The beef was wonderfully rare and delicious and just enough char to not over-power the rare and delicateness. Lush. We couldn’t manage pudding but got a beautiful congratulations plate of petit fours. What a place, it’s like they’ve taken all the good bits about fine dining and injected them with steroids (not literally obvs). Bright big (Instagram friendly) colours, massive flavours and the best views in London. The service too, it’s really very good, rigorous training, the staff knowledge is great and they all clearly enjoy working there. Having ordered some of the most expensive dishes on the menu I’m not sure Jim will take me back just yet, but I can’t wait to go back.